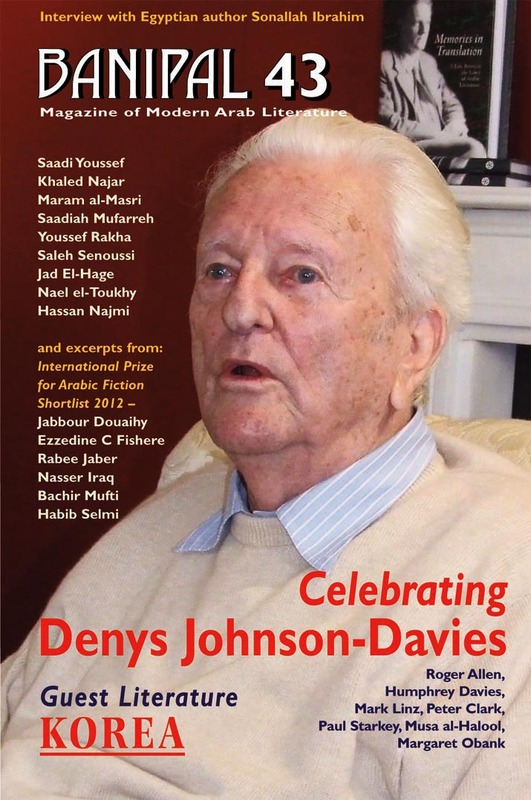 Earlier this week, Banipal sent out details of their 43rd issue, which will be a celebration of pioneer translator Denys Johnson-Davies. Davies, who Edward Said once called “the leading Arabic-English translator of our time,” has translated more than twenty-five volumes of short stories, novels, plays, and poetry, in addition to writing a number of children’s books, a memoir, and several works of fiction. The issue will also feature a number of works of fiction and poetry, including excerpts of the six novels shortlisted for the International Prize for Arabic Fiction and “guest literature” from Korea. Other scheduled issues include Banipal 44, with a focus on “Women Novelists,” set for release in the summer of 2012 and Banipal 45:Writing Palestine, which is scheduled for publication in the fall. An extract of his translation of Hunger, by Mohamed al-Bisatie. Translations of Mahmoud Darwish poems. An excerpt of Johnson-Davies’ memoir, Memories in Translation. “House of Flesh,” Yusuf Idris.